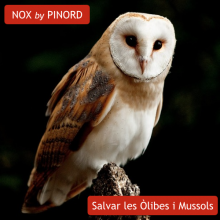 NOX (from latin: NIGHT) is the Pinord tribute to their workers who participate in the night time grape harvest, preservating the flavour potential of our grapes. It is also an attraction for the OWLS, whose number is decreasing. Together with the World Nature Foundation, we are actively working to bring them back and to protect them in our vineyards. By buying this wine you contribute with this worthy cause.